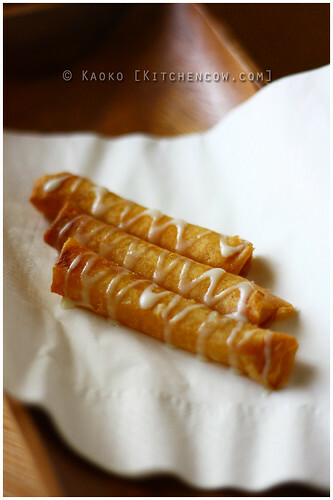 If you still have leftover tikoy from Chinese New Year, drop everything you’re doing and make these Tikoy Turon sticks. You will never look at the ubiquitous Chinese New Year sticky cake tikoy (nian gao) the same way again. Yes, you read that right. Tikoy turon. I chanced upon it at a local grocery. They had strips of tikoy wrapped in lumpia wrapper, fried then drizzled with condensed milk. It was glorious. I was told that the product was a seasonal offering, but then, it’s simple enough to make, so as long as you have tikoy, you’re good. 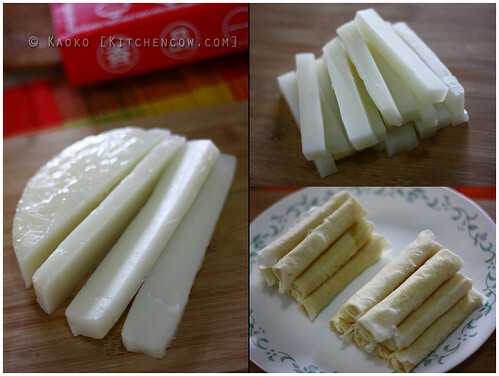 To prepare, simply cut raw tikoy into strips, then wrap with lumpia wrapper. Make sure it’s covered well, like you would an envelope, then seal with a dab of water. No need to add extra brown sugar as you would with traditional banana turon, because it’s sweet enough as it is. 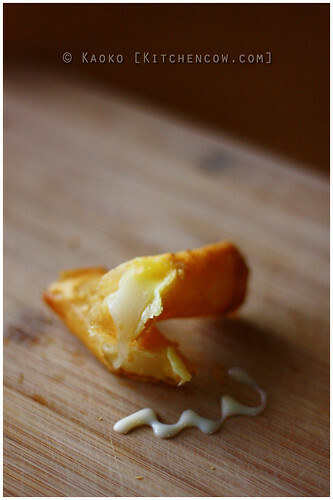 Fry then drizzle with condensed milk. It’s as easy as you imagine it to be. Cut, roll, fry. I thought that was evil enough, until online friend Jovan chimed in that they do that AND add a strip of cheese inside. WHAT IS THIS MADNESS? Of course I had to try it myself. 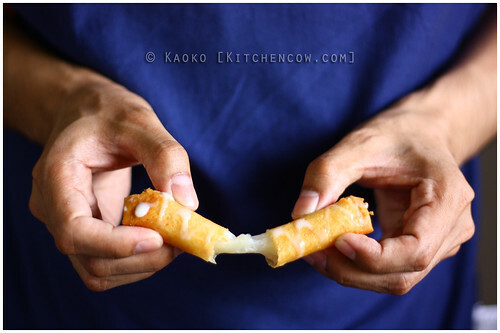 It is as you would imagine, sticky sweet tikoy melded with gooey, salty cheesy magic. I enjoyed it both with and without condensed milk, but I suggest just dabbing on a teeny bit, for added flavor without overpowering the cheese. Madness I tell you. Or magic. Either way, it deserves to be tried, even if it’s just to know it can be done. This looks and sounds too good to be true!! I still dream of this, haha! I was at Binondo last weekend and it was a must for me to buy a box of tikoy just so I could do this. Great inhtisg! That’s the answer we’ve been looking for. In-laws have introduced me to tikoy turon with cheese. It’s practically a staple here this time of year. When serving it at parties (so it’ll look a bit prettier), we dip one of the ends of the mini turon in sugar syrup, then sprinkle it with toasted sesame seeds. You might want to try that sometime too.